I bought this truck as my first work truck in 1992 for my business. Worked it, plowed with it and wheeled with it. Did a crazy motor in 97 blew it in 99. It was off the road till 2012. Restoration began in 02. It took a few years to find a great condition cab and bed. The bed came off a truck in the 80's and cab/ doors came from a guy who never ended up restoring his truck and had it since the early 90's. The hood, nose, frame and drivetrain is all original. Cab, doors, bed & tailgate were in mint condition. This truck was prepped, edged and finish painted black on the inside of all parts and primed ready for finish on outside prior to assembly. 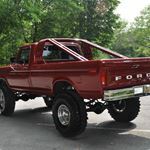 L&L Traction bars & 3 inch aluminum body lift. 39.5 Superswamper TSL IROK Radials with 16 inch ION Aluminum rims. Ford 9inch & Dana 44 front with 389 gears. NP 435 four speed transmission rebuilt and NP205 transfer case rebuilt. New Disk brakes & all new stainless brake lines. Every single front end part, bushing, ball joint, U joint all new. Driveshafts all rebuilt with Spicer U joints. Rear driveshaft upsized to a 5 inch tube. New seasoned 400 CI, Bored.50,10:1 Compression, Trick Flow Heads, Comp Cam, Holly 650/ 450-480 HP with 400 lbs of Torque. March Serpentine belt kit & billet radiator. MSD ignition & Rev limiter. K&N air/ oil filters and Optima billet battery set up. Three inch stainless exhaust with 7 inch stainless tips and ceramic Headman headers, with Flowmaster Super 40 mufflers. 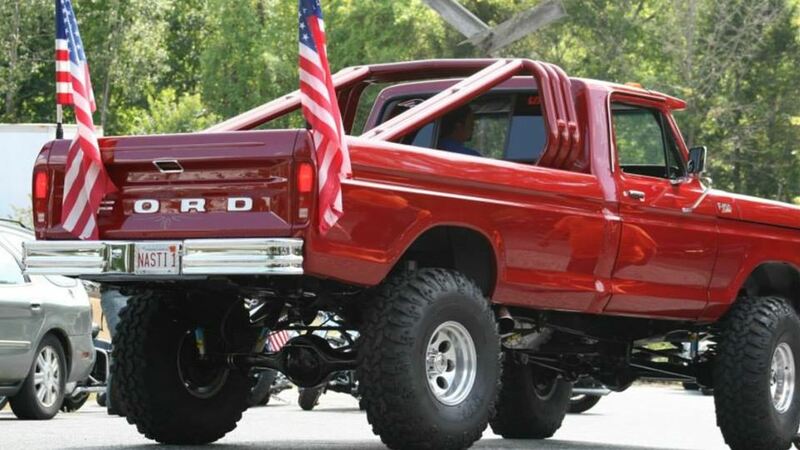 Sangria red mid 90's Ford color with all new chrome bumpers and nose. Lund sun visor and a custom triple double roll bar. I Just installed a new billet steering column with new wood cherry steering wheel with digital Dakota gauges. Without my labor I'm over $80K invested. Nasti1 gets new engine/ exhaust this year!